Traditional houses were often built with fireplaces to many of the ground floor and first floor rooms, so these properties have chimney breasts located both upstairs and downstairs extending upwards into the loft and out of the roof. As time has gone on, more and more people now have central heating which means the need for a real fire place, apart from it being a feature, is becoming less important, with room space being of higher importance. We are finding that many home owners that are modernising their houses or extending them are asking us to remove the old fire places and the chimney breasts to increase the size of a room. By doing this, you can gain the extra space you need to add more furniture into a room where it was not possible before due to a fireplace being in the way. We can even design and install fitted units to fit into your new found space once we have completely removed the chimney breast and the fireplace. The removal of a chimney breast however needs to be carefully considered due to it being part of the structure of a house. Milbarn Construction specialises in removing chimney breasts and has carried out this work throughout Essex, London and Kent. We carry out all our work to the highest of standards, whilst doing so tentatively, with safety always in mind. 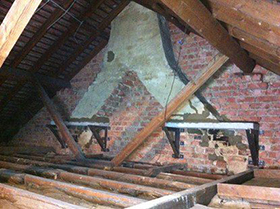 If a chimney breast is removed without being supported, it could cause huge structural damage and in some cases, areas liable to collapse. Whether you would like the whole chimney breast removed or just a part of it, we will ensure that your property is supported correctly during the removal process and the correct steelwork is fitted to secure the loads. We also benefit from having very experienced structural engineers and designers at our disposal, allowing us to efficiently organise all calculations and drawings that need to be submitted to your local authority. Common designs range from simple gallows brackets however we have completed the most intricate and unique steelwork designs. We are able to find a solution regardless of the complexity of the job in hand. Benefiting from our continual working relationship with a local metal fabrication company, we are well known within the industry to have completed some very complex work in previous years that most companies have not had the knowledge or experience to even quote on. Have peace of mind and take advantage of our £5,000,000 public liability insurance package, contact Milbarn Construction today to discuss having your chimney breast expertly removed. View our Chimney Breast Removal Gallery for our projects.